BTX Technologies’ XIRIUM PRO was recently used by Cory’s Audio Visual Services at the Professional Systems Network International (PSNI) Supersummit this past February. Cory’s AV, a PSNI affiliate, provided the AV system for the three-day event, held at the The Sheraton Austin at The Capitol in the main ballroom with multiple breakout rooms. The highlights of the system consisted of a multi-sized screen custom video wall arranged by Samsung and the recently released XIRIUM PRO wireless broadcast system from Neutrik, provided by BTX Technologies. 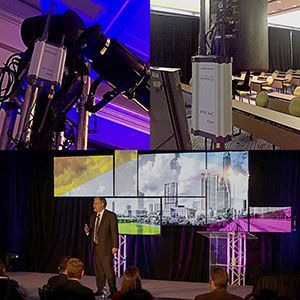 Cory AV opted to use XIRIUM PRO to transmit audio throughout the ballroom and to one of the breakout rooms because the event organizers wanted to avoid having cables around the open spaces. The XIRIUM PRO Transmitter Base Station was located on the truss at the front of house near the mixing console sending audio signals to two Receiver Base Stations – one in the ballroom for the main session and one to the breakout room roughly 120 feet away where the same audio program was being transmitted. The Receiver was set up behind the speaker with two walls in between, and no cables were in the hall as a hazard during the event. This installation of XIRIUM PRO was an excellent test for the system where it was going through walls, and the system performed flawlessly. “Cory’s AV supplied the PSNI group with a solid solution for the Supersummit. The Samsung video wall created a visually stunning centerpiece, and the Neutrik XIRIUM PRO wireless broadcast system made it possible to have studio quality audio in both the ballroom and the breakout room, so no attendees missed a single session,” said Chris Miller, managing director of PSNI. XIRIUM PRO will be featured at NAB in the BTX booth #C9806 and the Neutrik booth # C11022.